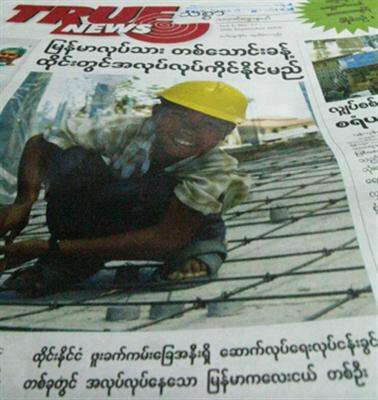 PHUKET: Burmese daily newspaper True News was ordered by the Press Scrutiny and Registration Board of Myanmar to suspend publication for two months, following its publication on September 30 of a large image depicting a Burmese child working on a construction site in Phuket. Mr Yeni, News Editor at The Irrawaddy, told the Gazette that, “An anonymous freelancer in Rangoon told us that the censorship board has ordered True News to suspend publication for two months due to a front page photograph that ran a caption reading: ‘A Burmese child working on a construction site in Phuket, Thailand’. Apparently the editors of True News were found guilty of not sending clear draft layouts to the Press Scrutiny Board. “Another Rangoon source said that True News had submitted the layouts, but the Board failed to censor the photo. Major Tint Swe, head of the censorship board, was then reportedly scolded by Information Minister Kyaw Hsan for the oversight,” said Mr Yeni. “The editors and reporters of True News are now afraid to give interviews with anyone outside Myanmar. We are unable to find out where, exactly, the construction site is in Phuket. We are very interested in covering stories about Burmese migrants in Phuket. “The Junta are paranoid and strange. The Burmese regime is not like any other government; they focus only on how to control media, especially when they work with journalists outside Myanmar. With the exploitation of child laborers, the Junta feel that they have been exposed for lacking care for their own citizens. Later this year we plan to visit Phuket ourselves,” he added. There will be a lot for them to report on here. The plight of Burmese workers in Phuket is well known to island residents. They are commonly seen huddled into the back of trucks and at squalid workers’ camps across the island. The camps have mushroomed on the back of a real estate boom driven largely by foreign investment in recent years. The situation made international headlines earlier this year when 54 unregistered workers suffocated in the back of a truck in Ranong while en route to a construction site in Phuket. A crackdown followed, and on June 11 former Kathu policeman Decho Kaewnabon was gunned down in front of his Patong home in a murder that remains unsolved. Decho, dismissed from the force for involvement in Burmese labor rings, allegedly continued in the business. His murder is widely seen as a silencing killing ordered by other influential traffickers. There have also been numerous extortion attempts made against Burmese workers and those who employ them, often by people posing as government officials. One registered Burmese worker who resisted an extortion attempt was shot in the face and killed in Kathu on March 30. Although there were many witnesses, that case also remains unsolved.